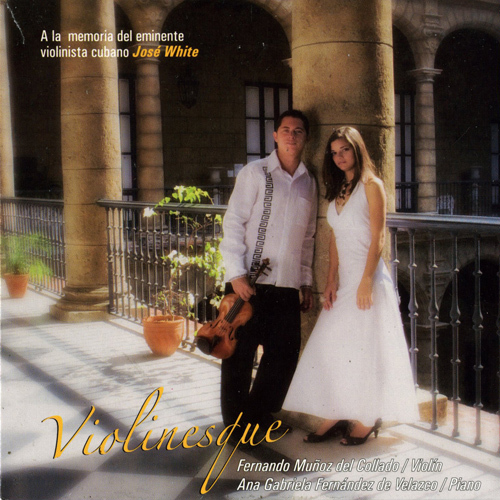 "A la memoria del eminente violinista cubano José White"
White's earliest association with the city of Paris dates from about 1855, when he was admitted to the Paris Conservatory as a student, following an audition with sixty rival candidates and the unanimous recommendation of his faculty jurors (Trotter  1986, 225). At the conservatory he studied violin with Jean-Delphin Alard, the pre-eminent master of the French school of violin playing; harmony, and presumably composition, with composer Henri Reber (1807-1880); and counterpoint and fugue with Ferdinand Taite (Argote 1953, 88). He was exposed as well to the considerable richness of concert music, virtuoso performers, and influential composer-musicians that this teeming metropolis had to offer a talented young music student in the 1850s. "The competition for violin [at the Conservatory] has offered a beautiful spectacle this year, being the most brilliant struggle. The first grand prize was conceded to Mr. White, pupil of Alard, and the second [prize] to Mr. [Aimé] Gros, from the same class... Mr. White showed himself [so] superior that there should have been created a grand exceptional prize in his favor. He performed with an extraordinary animation, not like a pupil but as a great artist who commands his audience. The jury itself was electrified" (Ramirez 1891, 178). 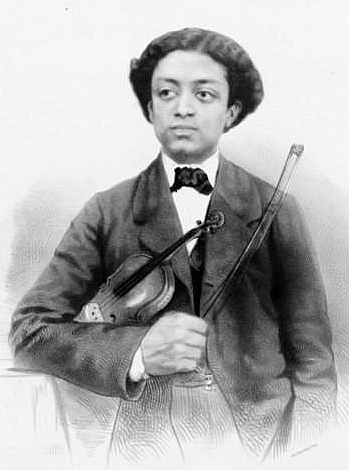 Although many other details about White's years at the conservatory are fragmentary, there exists evidence that he developed strong ties with members of the musical community in Paris and cultivated friendships that would later serve him well during the 1860s and 1870s when he began to concertize professionally. We know, for example, of his introduction to the musical circle of Félicien David and his friends through a letter written to the violinist by Giacchino Rossini (J.M.G.Z.1874, 4). Allow me to express to you all the pleasure that I felt Sunday last at the home of my friend Mr. David. Your warm execution, feeling, elegance, the brilliance of the school to which you belong, are qualities in an artist like you of which the French school can be proud. May it be, Sir, [that] with my sympathetic wishes I bring you good fortune by finding in good health the one for whom you fear today. Accept my blessings. I wish you a happy journey and a safe return. pertained to a serious illness of the young violinist's father, which necessitated his immediate departure from Paris for Cuba. 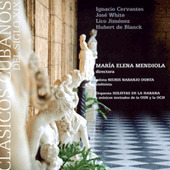 White apparently remained in Cuba through March 1860 and gave concerts throughout the island during this period. He returned to Paris shortly thereafter and resumed his studies at the conservatory (Argote 1953, 93-94; Stevenson 1975, 2). Also during his conservatory years, White participated in four public performances in 1861 that attracted considerable attention from the Parisian press and seemed to mark a turning point in his career; (1) his full-length recital with orchestra at the conservatory during April of that year (J.M.G.Z. 1874, 9); (2) his concert with orchestra at Salle Herz on April 11 (Le Ménestrel April 7, 1861); (3) his collaboration on the concert of pianist A.
Mansour at Salle Pleyel on April 15 (LeMénestrel April 7, 1861); and (4) his performance of a new quintet by C. Estienne on a matinee concert organized during December by pianist Casimir Ney, who would later perform chamber music professionally with White during the late 1860s and early 1870s (Le Ménestrel December 29, 1861). 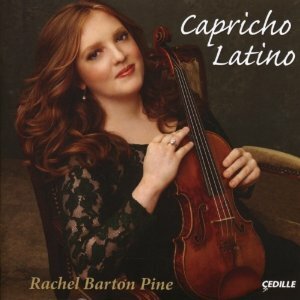 Violinist Rachel Barton Pine, Cedille Records' all-time best-selling artist, has created another rare - perhaps unique - contribution to the world's CD catalog: an album of Spanish and Latin American music written solely for unaccompanied violin. White appeared twice as guest soloist with the New York Philharmonic under Theodore Thomas during the 1875-1876 season and gave additional concerts in the greater New York area. 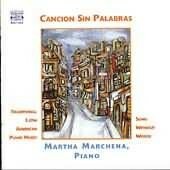 He also gave concerts in Boston, Washington, and Philadelphia (Argote 1953, 96). La Bella cubane: The bay of Naples (violin and piano). Paris: Ch. Hayet, 1910. 7pp. Recorded: Columbia CL-773. Concerto for violin and orchestra in F-sharp minor. 1864. Bibliothèque Nationale. Concerto for violin and orchestra in F-sharp minor. Edited by Paul Glass and Kermit Moore. Premiere: February 24, 1974; Avery Fisher Hall, New York; Ruggero Ricci, violin; Symphony of the New World; Kermit Moore, conductor. Recorded: Columbia M-33432 (Aaron Rosand, violin; London Symphony Orchestra; Paul Freeman, conductor). Library: Library of Congress. Hélas: Valse lente. Paris: Durdilly, 1907. Library: Bibliothèque Nationale. Marcha cubana (piano). 1909. Dedication: Ignacio Cervantes. 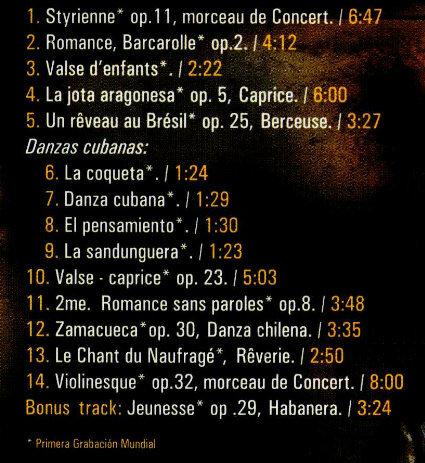 Six grandes études, op. 13 (violin, unaccompanied). Paris: Schonenberger, 1869. Library: Bibliothèque Nationale. 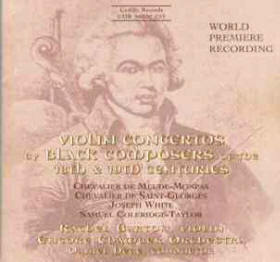 One recording of the music of José White is Violin Concertos By Black Composers of the 18th and 19th Centuries, Cedille 90000 035 (1997), which includes his Violin Concerto in F-sharp Minor (21:34) performed by Rachel Barton, violin and the Encore Chamber Orchestra led by Daniel Hege, Conductor.